Always an attention-grabber, vintage silver-bullion chief petty officer rating badges are highly collectible due to their intricate designs and usage of silver thread. There are many challenges and hurdles for collectors of militaria. Not unlike the difficulties other collectors face, militaria requires research, authentication and a healthy bank account in order to enable the afflicted with the tools to be successful in such endeavors. One of the most significant universal hurdles collectors face is the ever-increasing deficit of square footage needed for storing and displaying collections. I am no different from any other collector in that space is at a premium when it comes to safely storing my militaria. Without the proper controls being set in place, I could easily displace my closet space needed for hanging my wardrobe in favor of a growing assortment of vintage military uniforms. What sort of proper control could bring to bear the appropriate amount of pause before pulling the trigger on a deal to acquire the next amazing uniform? My collection, almost from my entry into militaria, has grown slowly due to my tempered approach, focusing on specific areas of interest. Within those areas, I incorporate a finer set of specificity that helps me to keep things under control. 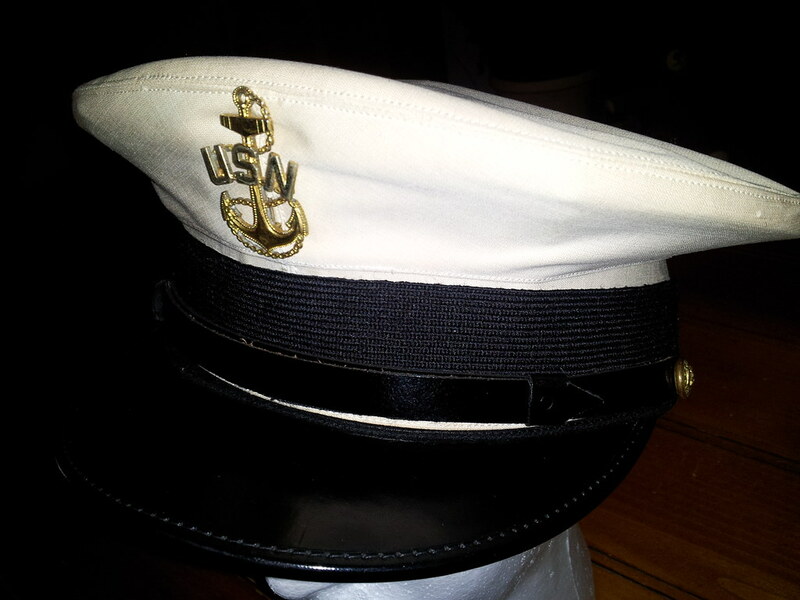 Like many U.S. naval collectors, I enjoy uniforms, rates, shoulder insignia, collar and cap devices and other assorted pieces. However, I tend to direct my attention to specific rates when it comes to uniforms and badges. 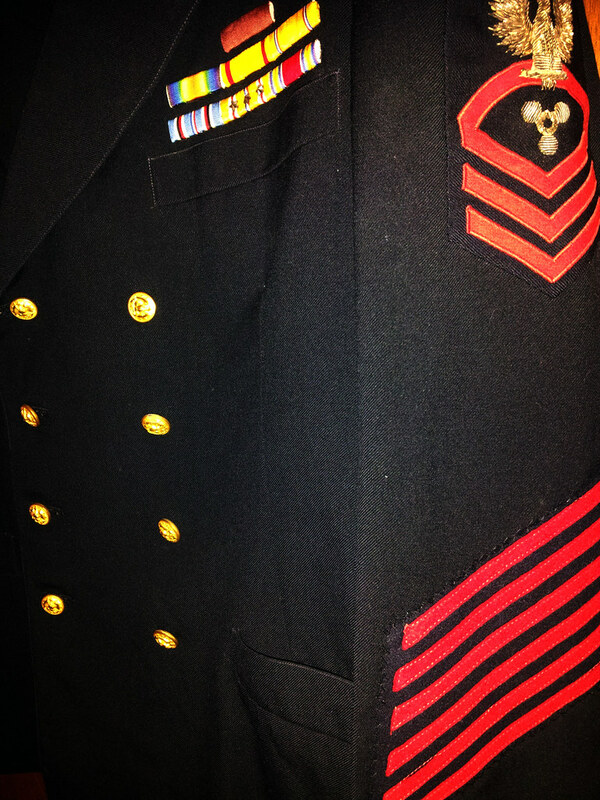 Mostly, my naval uniform collecting focuses on rates that were held by members of my family. 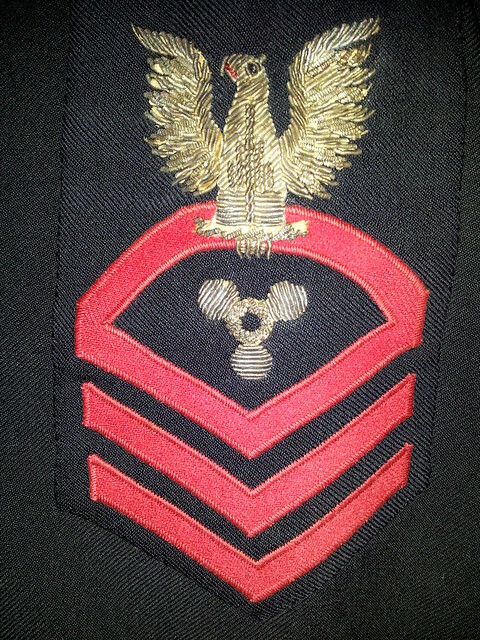 Only one member of member of my family ever advanced through the enlisted ranks to don the rocker-topped chevron of a chief petty officer, so my collection of CPO uniforms is very limited. On occasion, I might be tempted to acquire an item that falls outside of my parameters if it possesses other aspects that make it too good to pass up as was the case of my most recent acquisition. This CPO jacket has it all…well almost. It is an 8-button, tailor-made dress blue, World War II-era jacket complete with a silver bullion chief machinist’s mate rating badge and custom sewn-on ribbons. A few weeks ago, a chief’s uniform jacket and cap became available that was just too good to pass up. The dress blue coat was an older, tailored eight-button version indicating that it was made during (or prior to) World War II. 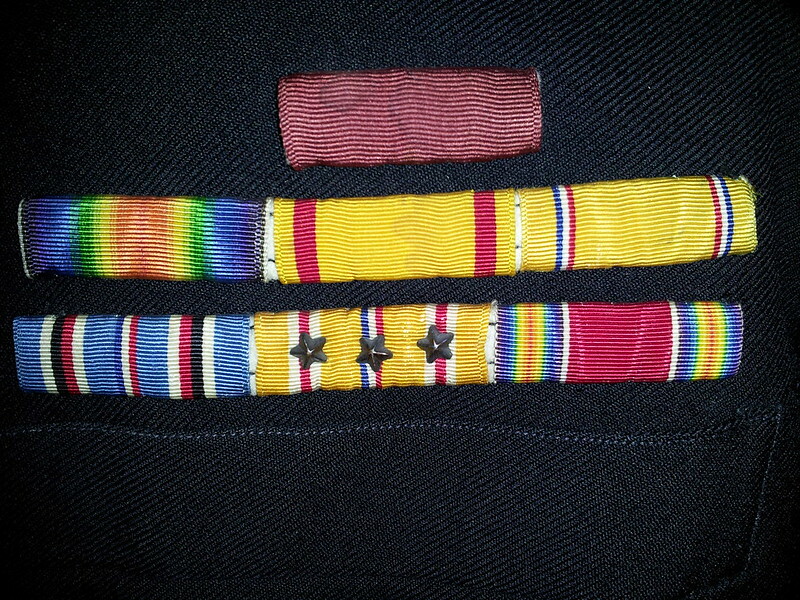 Affixed above the left breast pocket were 2-⅓ rows of custom (sewn-on) ribbons which clearly showed the chief as having served during and after World War I up to (and probably through) World War II. 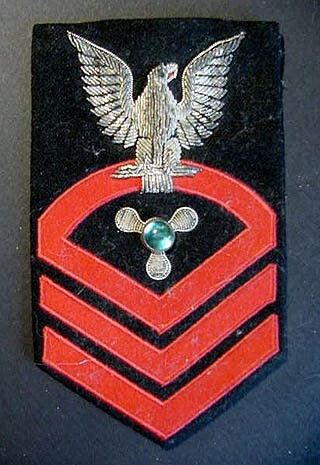 On the left sleeve were six hash marks showing that the chief served for at least 24 years. I have an affinity for bullion rates or insignia and the chief machinist’s mate insignia on this coat was the icing on the cake that put me over the top to make the decision to pick it up. Included with the CPO jacket was this WWII-era (wicker-framed) combination cap. The condition of the frame, visor and white cover are outstanding. For many of us, researching veterans is a challenge and when we learn about the original owners (of military uniforms) were, there is a compulsion that pushes us to discover where the served and what they did during their time in uniform. When a uniform (that we acquire) is inscribed with a name, we are invariably driven to pursue the history in order to retain it with the item. Sadly, this jacket was unmarked which only meant that I wouldn’t have any further work once I had my hands on it. The custom ribbon rack, though a little deformed from years of use and storage is complete with a Navy Good Conduct, WWI Victory, China Service, American Defense, American Campaign, Asiatic Pacific Campaign (with three campaign stars) and WWII Victory. After it arrived, I was even more impressed by the condition of the jacket and the silver bullion of the rate badge. 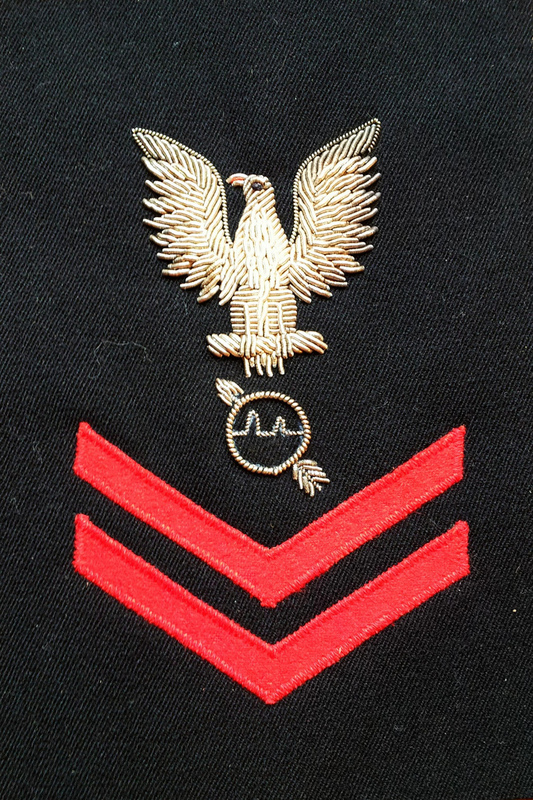 One glance at the Good Conduct ribbon (sans devices) and the six red hash marks, it is very apparent that the chief had some challenges with Navy regulations, staying out of trouble (when on liberty) or simply clashed with his superiors. I am sure his disciplinary record would make for an entertaining read. It is unfortunate that the jacket is forever decoupled from the sailor’s service. Regardless, the uniform is a great addition to my collection.